The project to conserve Dürer’s Triumphal Arch reaches the next stage. Sam Taylor takes technical photographs of the sheets discovering long-hidden details in the handmade paper, delicately unpicks old glue and gives the work a bath. Having joined the Museum’s team of conservators in the Paper Conservation Studio in January, I was excited to be plunged in at the deep end, assisting with the project to conserve Dürer’s Triumphal Arch. You can follow the story from the beginning by reading the previous blogs (see links at end of article). As the print was previously separated into individual and more manageable sheets, it was much easier to closely examine and document the condition of the print. Each sheet was photographed with normal lighting back and front. 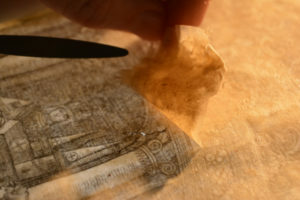 We have also taken photos with transmitted light by shining light through the paper to reveal any areas that are thinner and more vulnerable, as well as features such as watermarks, old repairs (which are thicker and appear darker) and pieces that had been added after printing also showed up during this process. One of the sheets on the light box. Albrecht Dürer, The Triumphal Arch. 1515–1517. Details visible in transmitted light. 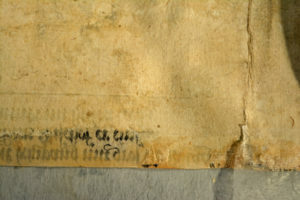 Left of the image: a tear in the paper and a watermark. Right: additional paper covering original text. We also use other photographic techniques that tell us more about the printing process and the paper. I was excited to be able to learn how to use some of the specialist equipment in the Museum’s imaging lab and imagine I was a scientist for a day! Reflectance Transformation Imaging (RTI) was invented by research scientists at Hewlett-Packard Labs and takes 75 photographs with a series of LED lights positioned at different angles under a dome (you can find more information here). These cast shadows in different directions that enhance the surface texture of the paper and, added together, the images can be animated to simulate light coming from different directions as you move the mouse. Conservator Sam Taylor taking RTI images in the Museum’s imaging lab. We had discovered some marks in the paper that are known as ‘blind stamping’, which became clearly visible under RTI. These marks are caused by pressure from parts of the wooden blocks that were not inked when the design was printed. We were hoping to be able to see the impression of the watermarks too, but disappointingly these didn’t show up. Image of a sheet with light from directly above. The same sheet lit from the side showing ‘blind stamping’. Once we had documented the sheets in detail, our next task was to remove the old, discoloured adhesive that was making the paper stiff and distorted. Tests had shown that the adhesive was wheat-starch glue – possibly with some flour. We had learned from our previous tests to remove the linen backing (you can read about the process in Joanna Kosek’s previous article here) that introducing moisture gradually was the best way to soften the adhesive. After testing different methods, we settled on using the same gel we had used previously in order to swell the adhesive and remove it. Before working on a sheet, we referred to the damage map that had been created for each sheet (by marking creases, tears and other remarkable features onto a thin sheet of polyester laid over the print). This allowed us to familiarise ourselves with any particularly tricky areas, so there were no nasty surprises when we started to remove the adhesive. We spread gel over the back of the sheet and, when the adhesive had softened, we could then gently lift it away using tools made from Teflon® – the same material applied to frying pans that stops your fried egg from sticking. The gel and smooth surface of the tool helped to prevent the paper from being rubbed and damaged. Conservators Harry Metcalf and Caroline Barry removing adhesive residues. We had located where there were vulnerable areas and tears, and where the edges of the sheets had been thinned before the print had been assembled. In some places there were little more than a few paper fibres holding the printing ink. In these weaker areas, it was a particularly slow process to remove the old adhesive: patience and a gentle but steady hand were needed. As the adhesive was very thick and discoloured it was quite satisfying (and strangely addictive) to remove the brown gunge and bring the flexibility back to the beautiful hand-made paper. We aimed to leave as many old repairs in place as possible but some were removed if they were causing distortions, or where the adhesive underneath was discoloured. Ink visible from the back of the sheet where the paper is exceptionally thin. After removing the adhesive we needed to remove any traces of gel. We decided to wash the sheets as this would also remove some of the discolouration and acidity from the paper. This is always a delicate operation: the sheets had to be supported and handled with care, as paper can easily disintegrate or get damaged when wet. After a relaxing bath, the sheets were carefully lifted out of the water and left to dry. Lowering one of the sheets into a water bath. Some of the sheets also had inscriptions in ink, which were slightly sensitive to water and might have faded if the sheets were washed. 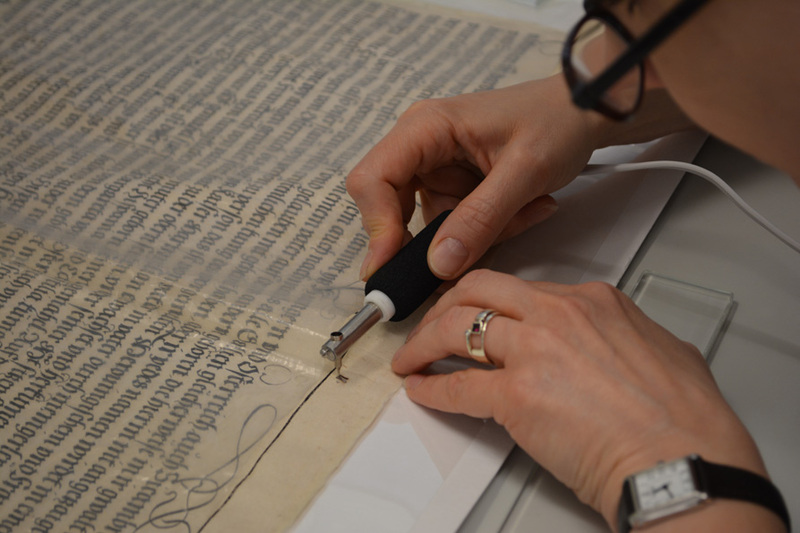 To protect the ink we applied a special type of wax used in conservation. Unlike normal wax, it changes directly from a solid into a gas and slowly evaporates, leaving no trace on the paper after a few days in a fume cupboard. We used a heated tool which is used for decorating Easter eggs to apply the wax over the ink – we often have to think creatively in conservation and use tools that have been designed for something else! Once we have finished washing all of the sheets we will need to look at them again to see if anything more needs to be done before the next stage, such as removing any stubborn adhesive and easing out the creases. 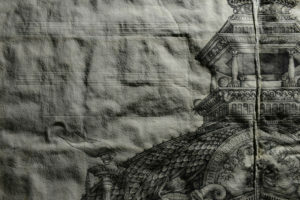 After that we will start repairing the sheets: I feel another blog coming on – watch this space! 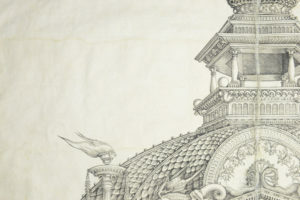 The conservation of Dürer’s Triumphal Arch has been made possible by the generous support of Howard and Roberta Ahmanson. You can see an interactive zoomable image of the print here. You can see the removal of the textile backing here. A beautifully illustrated gift book on the prints and drawings of Albrecht Dürer, the famous German artist is available here.